It is becoming more and more important for websites that they are fast to load. Visitors on the web are growing more impatient. Search engines like Google rank sites that are faster to load higher in the search results. For all of these reasons, we decided it was time to make the WordPress sites we host even faster, by configuring them in a smart way. We did this last week Friday, and the results have been remarkable. We use a service called Pingdom to monitor our server performance and uptime, and it also pings a page from several of the sites once a minute from dozens of locations on the planet. The average response time is recorded and plotted in a graph. Here is the graph for the past 14 days (so 7 days before and 7 days after we optimized the site). As you can see, before we optimized the sites on October 18, the average response time of the site home page we used for this comparison was around 711 ms. That’s not bad, actually, but there was room for improvement nevertheless. 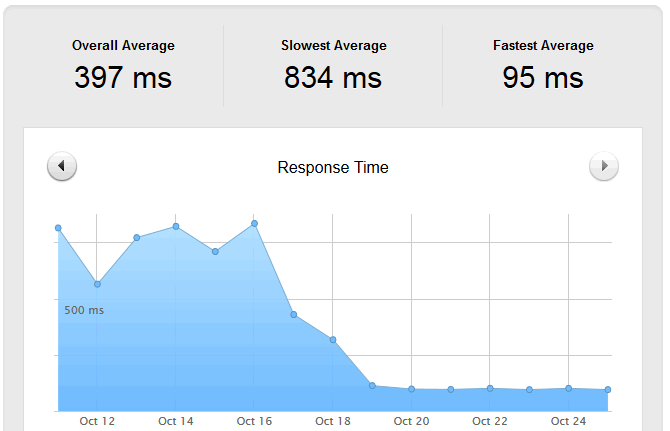 After we optimized the site, it was loading a lot faster, with an average time of 99 ms. That is more than 7 times faster! We were able to do this by tweaking the settings of the caching plugin we installed in WordPress, and cleverly using the large amount of memory in the servers. We were able to buffer almost all of the site’s pages in memory instead of having to load them from disk each time they need to be retrieved. What service is this that you offer for WordPress sites? We started using WordPress many years ago to run our own websites. Over time, we also begin hosting websites for customers. We still do both, but we also have a service where we host landing pages for marketing campaigns, in many cases specifically for mobile devices. This is useful if the advertiser doesn’t have a mobile responsive site yet, or can’t create a campaign specific landing page quickly enough.